I'm back. Final editing of my new book, PUSHING THE LIMITS, accomplished this week. Book has been announced in the Naval Institute Press catalogue for the Fall; publication in December. 31 photos including 2 maps. 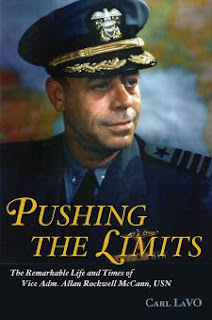 Vice Admiral Allan Rockwell McCann left no reminiscences that might reveal a deeper sense of his extraordinary service, but naval historian Carl LaVO has filled that void by writing this revealing—and often inspiring—biography. Among McCann’s many accomplishments: Served as liaison officer for the modification of the antiquated O-12 submarine into the privately-leased Nautilus that made the first attempt to sail beneath the Arctic ice shelf in 1931; pioneered the McCann Submarine Rescue Chamber; directed fire from the sub tender Pelias at Japanese aircraft attacking Pearl Harbor; commanded the battleship Iowa during the Battle of Leyte Gulf; was Chief of Staff of the Navy’s 10th Fleet that stymied a last ditch effort to attack North America via U-boats; headed the Navy task force that transported President Truman to the Potsdam conference; and as ComSubPac was aboard the first submarine to navigate under the polar ice in 1947. This book is an overdue appreciation of a significant admiral who has been all but ignored in naval history.